Endoluten contains 200 mg of pineal peptide bioregulators. 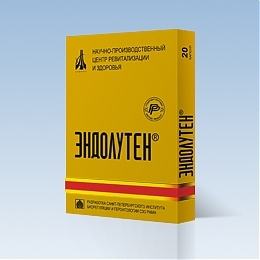 ENDOLUTEN® is a peptide bioregulator obtained from the pineal gland. Clinical studies have revealed that Endoluten restores the neuroendocrine system, normalizes metabolism and melatonin secretion. What their secret research uncovered - that was used for two decades on many thousands of men and women - was a remarkable link between short chain peptides and DNA. Now their published research is in the open and it identifies that each organ/gland/tissue uses a highly specific short chain peptide to act as a ‘short cut’ to initiate protein synthesis. These peptides can be found in food and unlike proteins they can enter the blood through the stomach. Through a comprehensive list of patents and even copyrighted PowerPoint slides, the Russian research group are showing that each of the concentrated peptide bioregulators so far examined interact with particular strands of DNA - effectively and very specifically activating repair and regenerative processes. This is a remarkable story since what we are describing here are individualized gene switches and since they have been tested for many years on thousands of individuals, without report of any serious side effects or contraindications to date, they could be set to ‘out do’ stem cells. Why? Because this peptide therapy is relatively cheap, highly specific, can be taken orally and doesn’t require any suppression of the immune system to operate fully. Professor Khavinson and his award winning team at the St Petersburg Institute of Biogerontology have discovered that each organ/gland has a biological reserve and despite the origin of the tissue they have studied, incredibly each one is always set at 42%. Even dosing doesn’t need to be daily, these peptide bioregulators have been shown to act even after a simple course of 2 capsules daily for 10-days. Healthy individuals only being encouraged to repeat the course 6-months later, although of course depending on the need this course can be repeated every 3-months, 2-months or 1-month if necessary. But compared to a hormone replacement therapy this is interesting, since hormones would require almost daily application. But these peptide bioregulators aren’t hormones, they are acting on the gland concerned to ‘encourage’ it to become active and effectively ‘younger’ by triggering/activating the DNA responsible. Take two capsules daily for 10 days. Others who require more than just maintenance may need 2 capsules daily for 30-days and repeat bi-monthly. All regimens may benefit from the synergistic effects of Ventfort. Better than stem cells for the brain and CNS? Better than stem cells for the adrenal glands? Better than stem cells for the prostate gland? Better than stem cells for the kidneys? Better than stem cells for the testes? Better than stem cells for the retina? Better than stem cells for the blood vessels? The better form of Tyrosine.